In response to our campaign and the hundreds of emails sent by Anti-Slavery supporters, H&M moved to take some steps to limit the risk of its products being linked to modern-day slavery. H&M now requires direct suppliers to sign a commitment to not use Uzbek cotton. In addition, H&M has asked its 300 most important fabric suppliers to stop sourcing Uzbek cotton. H&M has made a commitment to stop doing business with direct suppliers and strategic fabric mills that do not stop sourcing Uzbek cotton. Going forward, H&M plans to conduct random checks to ensure compliance. Although H&M has not gone all the way and fully implemented all the steps set out in the so-called Daewoo Protocol, we believe it right to give H&M time to implement the commitments it has made. In the meantime, we are turning attention to another major clothing brand – Nike, which is refusing to cut ties with one of the major companies profiting from the forced labour in the Uzbek cotton industry. 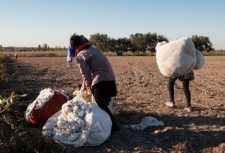 Daewoo International, the largest processor of cotton in Uzbekistan, is one of only a handful of companies that have defied an international call to stop using Uzbek cotton harvested using forced labour. Over 130 apparel companies (including Nike) have taken a stand against forced labour in Uzbekistan, by pledging not to buy Uzbek cotton. Unfortunately, Nike, which sources synthetics from Daewoo, is refusing to end its relationship with Daewoo in spite of the fact that several other companies, including H&M, C&A, and Michael Kors, have moved to cut ties with Daewoo because it profits from modern day slavery. Uzbek human rights activists are calling on apparel companies to completely cut ties with companies like Daewoo International, that are profiting from modern-day slavery in the Uzbek cotton industry. The Cotton Campaign, a coalition of organisations working together to end forced labour in the Uzbek cotton industry of which Anti-Slavery International is a member, is therefore calling upon Nike to stop doing business with Daewoo and implement the Daewoo Protocol – a series of steps the company needs to take to eliminate Uzbek cotton from its supply chain. An open letter to Nike signed by Uzbek human rights activists, political leaders, and prominent dissidents calls on Nike to stop doing business with Daewoo. 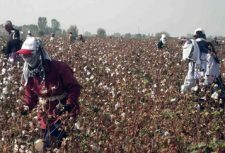 The letter describes the recent death of 18-year-old Navruz Muyzinov, who was beaten by police officers in Shahrisabz, Uzbekistan when he left his assigned cotton field before meeting his cotton picking quota. According to a letter to Radio Free Europe from an anonymous source, who said he witnessed the episode, the teenager went to pick cotton that day instead of his mother. Feeling sick, he left the fields early. On the road he was stopped by two police officers, who quarreled with Navruz and beat him. The teenager was later taken to a hospital, where he died that evening. Joanna Ewart-James, Supply Chain Programme Co-ordinator at Anti-Slavery International said: “This is an opportunity for Nike to do the right thing and end its association with a company that continues to process around 20 per cent of Uzbekistan’s cotton output despite the industry’s heavy reliance on state-sponsored forced labour. 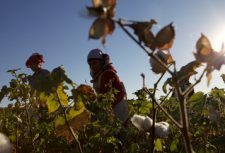 “Nike would apparently rather harbour companies in its supply chain that are profiting from human rights violations than help bring an end to Uzbekistan’s heinous forced labour system,” said Umida Niyazova, founder of the Uzbek-German Forum for Human Rights, another member of the Cotton Campaign. Anti-Slavery supporters can take direct action by sending an email to Nike from the Anti-Slavery International’s website at www.antislavery.org/cottoncrimes. For more media information and photos from the cotton fields contact Jakub Sobik, Anti-Slavery International Press Officer at j.sobik@antislavery.org or on 020 7501 8934.